In a media release following Treasurer Scott Morrison's 2017-18 budget speech, the Society expressed disappointment over university funding being slashed, graduates being required to pay back fees sooner and poor overall support for those locked out of the job market. It was a case of hope versus humiliation, the Society's National Council CEO Dr John Falzon wrote in a Eureka Street article. 'For young people of Australia, Budget 2017 boosts inequality instead of building a better future," he said. Cathy McGowen, an Independent Member for Indi, agreed with Dr Falzon, when she shared her concerns over difficulties students seeking higher education now faced, in an interview with radio station 1494 2AY Albury. The Society obtained further coverage of its budget concerns via ABC news radio outlets in several capital cities, on Channel 9, Network 10 and at SBS. In a lengthy interview with Richard Glover, ABC Radio's 702 Sydney Drive program host, Dr Falzon criticised government plans to random drug test welfare recipients. He described the measure as 'offensive and disrespectful' to people who were locked out of the labor market. The Society's reaction to the federal budget was also noted in an article in Probono Australia. Along with pieces in The Catholic Leader and the Guardian Workers Weekly. On Sunday 14 May, Dr Falzon joined Reverend Bill Crews for a post budget chat. 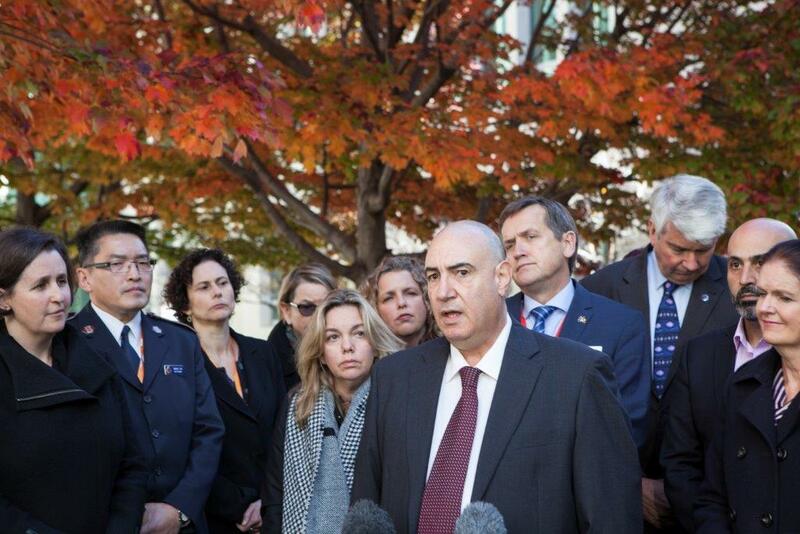 Photo caption: Dr John Falzon speaking at a press conference members of the community sector held at Parliament House Canberra a day after the budget.